By Adam Ganz (Sports Correspondent). The Sharon High Girl’s Varsity Basketball team has one major goal for this year: to make the state tournament. After a 3-5 start, the team plans to bounce back to a winning record. In order to make the tournament this year, the girls team will need to win a minimum of 10 games. To do so, the Eagles are working to get some of their younger players more varsity experience, according to senior captain Alyssa Piazza. “Starting this season with only 3 seniors and 3 juniors, we had a very young team compared to the other towns in the Hock. We have been working hard to get everyone better to provide the team some depth,” said Piazza. With the three seniors competing in their last season in an Eagle uniform, Piazza says they want to leave it all on the court. “We have proved that we are a hard team to beat and that every girl is capable of competing at the varsity level,” said Piazza. Because of the new faces representing the team this season, captain Charlotte Ransom says bonding will play a large role in their success. “Meshing together as a team will also have a major part of our success this year,” said Ransom. Team captains Alyssa Piazza (4th) and Charlotte Ransom (6th), along with freshman Emma Eberhardt (10th), lead Hockomock Sports ranking of the league’s top scorers. Piazza has scored 12.3 points per game (PPG), Ransom 10.7 PPG, and Eberhardt 8.7 PPG. 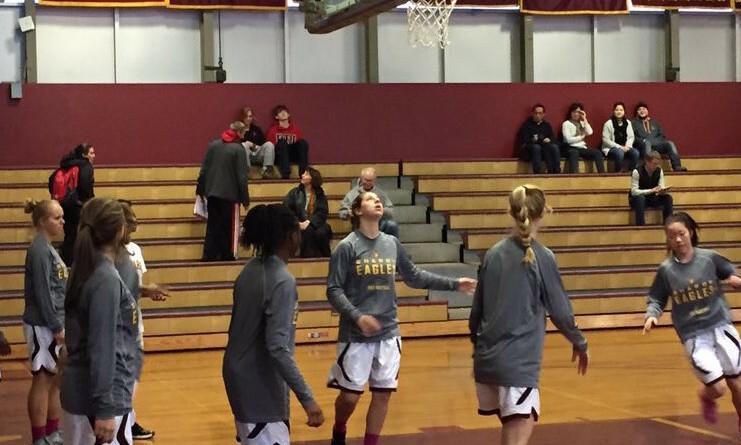 The Eagles’ last two games ended in a 62-30 loss to Oliver Ames, with captain Alyssa Piazza scoring a team-high 10 points, and a 53-45 loss to Canton. The girl’s team looks to get closer to .500 in Canton this Friday at the Bulldogs home court.